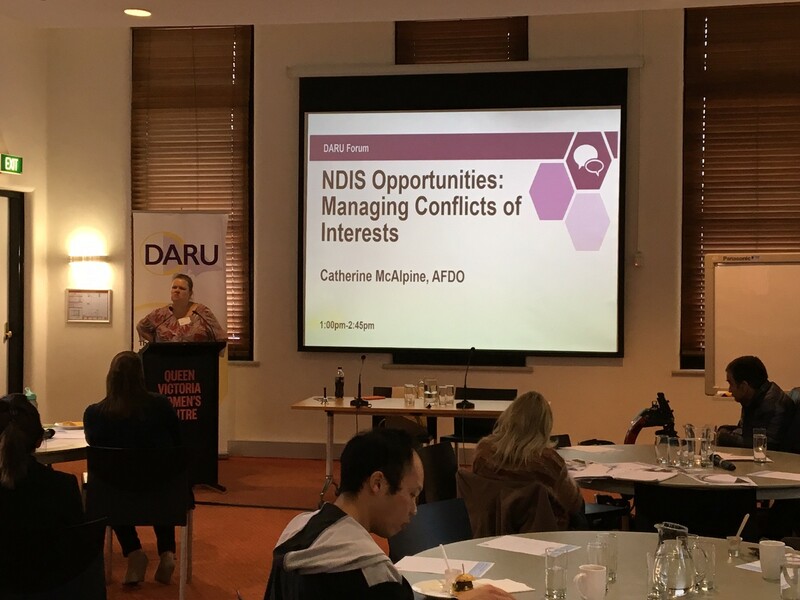 Catherine McAlpine, Senior Manager of NDIS Disability Loop, from Australian Federation of Disability Organisations (AFDO) introduced the NDIS Opportunities training series that have been developed to resource and assist small community organisations as they navigate the significant changes the new market environment brings. Particular emphasis was given to how advocacy might fit within the NDIS Price Guide and Support Clusters. It’s my absolute pleasure to introduce you all to Catherine McAlpine. Catherine works for AFDO and delivers training under the disability loop. Catherine will present her NDIS Opportunities Training Module. It’s a 3-hour long training session but she is kindly going to condense it and present to us today. It talks about conflict of interest issues. I’m sure this is a fascinating subject for you all this afternoon. Briefly an introduction into who Catherine is. Catherine has been active in the disability sector since 2005. In 2007, she was appointed the Executive Officer of Down Syndrome Victoria. In 2011, she was appointed the CEO of Down Syndrome Australia. Catherine feels very fortunate to be in that position. It combines professional skills and personal passion. Catherine has three sons, and her middle child Julian has down syndrome himself. Catherine now is a Manager of Disability Loop Program, which is run by the AFDO. The funding for this workshop has been provided by the NDIS sector development funding. It’s a series of workshops and it fits the needs of small community organisations such as the ones that everyone comes from here today. We encourage you to really save your thoughts for the discussions that we will be having. Catherine will talk to you more about her NDIS training. Please everyone warmly welcome Catherine. Thanks so much everyone, it’s lovely to be back. Always feel that’s a positive when you’ve presented at a group and they invite you back again, so thank you. Firstly, I would like to pay my respect and acknowledge the traditional custodians of the land in which this meeting takes place. I want to pay respect to elders both past and present. Also, I would like to pay respect to all of you advocates. It’s such an important job. I tell people that I’m an advocate but as you know my CEO roles involve system advocacy but I get so cross. I sometimes find myself struggling to control my emotions in some of the difficult situations and I take my hat off to people who can do that day in day out. Thank you very much for having me here and treating me like I’m one of you. Certainly, suspect some of you may have heard this story but I wonder sometimes whether my kids know what advocacy means. I know that when my eldest son was 13 he had to go do swimming sports. They were in the change rooms at the swimming centre and there was a couple of young men with down syndrome came in. They didn’t quite speak the same as everyone else and one of them maybe was singing. A couple of kids started imitating them. Well my son didn’t know what advocacy was but what I can tell you was he took his tool kit and his tool kit because he is a 13-year-old boy didn’t have much in it. He took out his feet, went over, and kicked the kid in the shins. The kid stopped but was really silly and dobbed on him. Said to the teacher Lee just kicked me. All kudos to the teacher, because the teacher looked at him and went actually you don’t generally go around kicking people, why did you do that Lee. And Lee said, well because and said so. Then said to me with great satisfaction and then we had a really great discussion about why being different is okay. I thought good on you he has learnt to advocate. Unfortunately, he is probably learning from me and he kicks when he should talk nicely. But we’re up and running. Now, today Melissa said that I was condensing three hours of workshop and actually trying to condense about twelve hours. We’ve actually got four workshops that are three hours each. But I have tried to pick out the highlight things from our experience so far that are of the greatest interest to advocacy agencies. I also will talk specifically about conflict of interest and that discussion about conflict of interest, luckily is informed by the fact that yesterday I had a meeting with Caroline Wilks who is one of the DSS, heads up the DSS team that’s responsible for the NDAP program. I was able to put to her a whole series of the conflict of interest type questions that have arisen from an organisational point of view. I have also been given the hint that finishing earlier rather than later will be well reviewed. I too have to race off and do the working mother dance. I’ll try and keep it moving and I will probably allow a little bit longer for questions than we might have initially anticipated. I found so far in the workshops that quite a few questions come up. You’re biggest criticism of me today is I am going to rush through a bit and if we allow a little longer for questions and that means you can pick me up and talk about some context or more detail I might have missed in this context. This presentation, the materials from the workshops themselves are still being finished in terms of their accessibility. What we’ve done is the workshops that we’ve run so far, we ran them in Melbourne first. We have taken that feedback done a little bit of polishing and they’ve gone to print. They’re quite big PDFs and we have to make sure they’re fully accessible. And because we’re busy also booking other workshops we’re a bit under the pump. We’re still about two or three weeks away. After that, the participant handbooks will be available on the Disability Loop website. If anyone, I think there might be some people that came to our workshops I said about two weeks ago, so another two or three weeks. This particular presentation I have cobbled together from some of our other materials. I don’t have a specific copy of this presentation I’m afraid. The first thing about the workshops that I have to say is that the free workshops in Victoria have actually finished. But I am going to just talk to you about them a little bit. The first set of workshops are called The Opportunities Workshops that I’m really talking about today are finished in Victoria. I just wanted to point out to you that they will be available they are free workshops. They will be available in Sydney, Adelaide, Hobart in terms of the nearest capital cities. If you felt that a CFEO or board member from your organisation I just point out they still haven’t run and are still available if you’re in a position to travel there. We will continue to accept this type of invitation if that’s at all helpful. The Understanding Workshops, which I will explain in a moment, we ran the free ones already. We’ve already run some fee for service, train the trainer sessions for service providers in Melbourne. We will run a second set. If you were to email me very nicely on Disability Loop @ afdo.org.au I might be able to squeeze you in as a freebie there. Just email Disability Loop and say could you forward this email on to Catherine if you want to try and get a place at the Train The Trainer Workshops and we will do our best. The Train a Trainer Workshops are the nuts and bolts of the NDIS. They’re very much going into some detail. They’re four organisations that do other training or give advice or give information to people with disability and families. They go through how does the NDIS work, reasonable and necessary, which interestingly has actually been the most popular workshop. I thought it might be the planning one but it turns our reasonable and necessary. Planning and Standing Strong, I Have My Plan What now – that’s about plan implementation, Plan Management Explained and is Self-Management For Me. What we found is some people have booked in for some and not all and then what happens is they ask questions and we say that’s explained all in Workshop Number 4. We can’t necessarily get time, we go into a fair bit of detail on each topic, we can’t necessarily do an unrelated topic because we only have the time available to do the one. Those ones I described are the ones we will be doing fees for service in Melbourne. As I said contact, if you’re very keen to come to some or contact me, we will do our best. You need to be very discreet about the fact that we had let you in for free. The Opportunities Workshops, both sets of workshops come out of the gap analysis we did last year. We got really strong feedback, quite a lot of people with disability if not the majority don’t get their information from the internet and in fact get information from community organisations. It might be a disability specific organisation, it might be an advocacy organisation, might be a cultural grouping, but it’s through those grass root organisations where people meet with their peers that a lot of information is shared. So the reason we’ve put together the understanding group of workshops was to try and really reach – but those organisations have very few resources. Just talking about being in rural communities where you don’t have the resources near you. So one of the things we were trying to do was create resources that were easily accessible to organisations who could then use them to give good quality information to the people they support. The Opportunities Workshops are directed at organisations. This is just really looking at the sustainability of organisations and the opportunities for organisations within the NDIS environment. And talking through some of the changes for us as people that work in organisations. That’s working on the theory, which I think is relevant. People with disability are best served if all organisations don’t fall over as we manage the transition to the NDIS. It’s making sure we can navigate that change as organisations as well as people with disability and families. The four workshops there, Opportunities in the NDIS for Community Organisations and NDIS Opportunities in Detail. That particularly looks at opportunities around becoming a registered provider of supports and particularly around the issue of provider of support coordination. I’m going to spend about half of today talking about that. The third one is ILC Readiness for Community Organisations. I am going to read out the list that we finished the workshop on in terms of the readiness activities that you might want to think about doing now in the lead up to the ILC on the assumption that ILC might be of interest to you as well. Then the last one is Navigating LAC and the Participant Pathway. That one very much talks about – there hasn’t been a lot of discussion about local area coordination and what that means for organisations like us. I have to say the LAC part is possible or the possible overlap is possibly more relevant for disability specific organisations and information providers even though you provide information as well. I haven’t gone into that detail today but that’s the one where we also talk about the new first plan process as well. Certainly when it comes to questions today assuming we’ve got enough time I’m happy to take questions on the broad range of topic and not just what I have talked about today if that’s helpful. The highlight issues – again in the workshops we’ve got time to set some context and got time to go into a bit of detail. Today I’m going to summarise it fairly quickly. I apologise in advance, I am going to try not to move too fast. I have tried to carrel it but if I do move too fast let us know or certainly when we get to questions feel free to ask any clarification questions. The three things I’m going to talk about within the highlights of the training are What is Support Coordination, The Case for Independent Support Coordination and I’m going to talk about ILC Readiness. Then I will talk about the Conflict of Interest stuff in the last part of the presentation. The first thing I wanted to talk about was What is Support Coordination. The NDIS have when I say released some figures, certainly some of us who have access to some of the materials coming out of the CEO forums and forums like that, are aware that they have estimated that about 20% of NDIS participants will have funding for support coordination in their plans. That’s about 92,000 people. Keep that number in mind as we talk about support coordination. Support coordination is part of what is called The Assist Life Stage Transition Support Cluster in the NDIS price list. That means if you go online and look up the NDIS price list you need to find the heading Assist Life Stage Transition. Now what that’s short for is the assistance in coordinating or managing life stages transitions and supports. This support cluster, which is a cluster of support items – so in the NDIS price guide, there are – these are the things that appear on plans or the things that you as providers invoice the NDIA for. Each support item has its own unique number. Those supports are gathered together in a support cluster of similar activities that organisations are likely to deliver. Basically they’re similar support items that need the same sort of staff capabilities. If you’ve got people that are capable of delivering one type of support coordination then you’ve quite possibly got staff members who are capable of delivering more than one support item. This cluster includes short and long-term supports that focus on strengthening the NDIS participant’s ability to coordinate their supports and to assist them to live at home and participate in the community. The broad range within this can include activities such as assisting the person with disability with budgeting, life planning, parenting training, resolving crisis situation, developing capacity and resilience in the person’s network as well as coordinating complex supports. Within this support cluster, there are three funded support items that are often referred to collectively as support coordination. When we talk about support coordination, in the sector when they use the word support coordination they’re generally talking about a cluster of three support items. These supports are provided to NDIS participants to help them get their plan going. George just asked if there was a slide. Because I cobbled together this from our other stuff, I didn’t have enough time to put together. I didn’t have enough time to do the editing of the existing power points that we have. It’s about planning implementation. So what we discovered in our gap analysis and we weren’t the only ones that discovered this is there is more than one instance where people would get into the NDIS, go through access get their plan, had a plan and then nothing would happen. Because the question is what do I do next? I’ve never had to choose a provider before, I don’t know how to go about researching, I’m not sure what to do. Putting in more support coordination is one of the answers and that’s one of the reasons why they’ve now used the data they’ve got in the trial sites to say about 20% of people will need support coordination in their plans. Plan implementation can involve finding support providers who will fulfil the needs of an NDIS participant. It might mean introducing them to each other the provider and the person. And providers of support coordination also help participants organise both funded and informal supports. So also help people link into networks of informal support or leverage their own existing networks or grow their own existing networks of informal support. Now many advocacy agencies already undertake many of the activities that can be defined as support coordination even though some of these activities might have been called different names. I will go through some of the details. It’s worth actually thinking about whether or not your organisation has these staff competencies or does these activities even though you might call them a slightly different name, like you might call them advocacy. First thing to notice is the staff experience and competencies for assist life stage transition. The expected competencies, when you apply, if you’re an organisation you apply to the NDIA to register as a provider. You will have to show competencies for the support cluster that you apply for. In this case, you would be applying for assist life stage transition and to do that you would need to show that your staff either had if you were offering peer support, lived experience of disability or mental illness and relevant experiences or skills of training to perform this activity. Or you might have people who are qualified as disability support worker, occupation therapist, social worker, might have a diploma in disability studies plus at least 2 years of experience or a Certificate 3 in disability services. So the critical thing to notice there is that the peer support and experience one is that you might already have people in your organisations who already meet those criteria. Then the question is what are the activities you might provide. One is support connection. Support connection is short-term assistance that improves the ability of NDIS participants to interact with all types of disability support. So support connection increases the capacity of NDIS participants to maintain relationships with support providers and deal with any issues that come up. I have made a mistake and put a detail in here that’s about to become wrong. But the NDIS will pay providers $55.50 per hour for support connection. Of course, the new price guide is coming out on the 1st July and that will no longer be the case. Support connection is one of these things where people what they found in plans is typically there is a group of people that might need about 10 hours of support, they just need some support to get going and after that they’re alright. Support connection is about helping people get going. It’s relatively short term it’s likely to happen at the beginning of a plan. It might have a couple of touch points along the way but that’s what that is. Then there is coordination of support. Coordination of supports is quite similar to its support connection but provides longer-term assistance. In addition to the activities I just described it also helps people in more complex environments. Coordination of supports might help find solutions to problems that participants face in times of crisis and help develop their resilience. It’s a longer-term thing. There might be some people that just need support connection for a longer time. And for this at the time of writing, the NDIS was paying $90.46. Certainly it will be interesting to ask the guys that are speaking after me about how those price points go but I know I have already heard feedback that support connection is difficult. That $55.00 an hour for only a relatively short number of hours – you need a lot of people to come through your business to make that sustainable. But that coordination of support, which is a little bit longer term and pays at the $90.46, is possibly a line item that might be of great interest. There are also some other activities within this cluster that don’t come under the support coordination umbrella but are of interest. One is assistance with decision making, daily planning and budgeting. I’m not absolutely sure but I think that might be one of the ones where supports for decision making that’s the line item where supports might come under and that’s the sort of work that advocacy workers often do. There is life transition and mentoring. One of the things to think about that is that now they’re going – I don’t know whether you all know about first plan, I am going to take the risk you know about the fact that first plan is a quicker process for people coming into the NDIS during the transition. But one of the things that coming in really quickly means that people get a very quick plan. They might not have done all their thinking about their planning yet and they might not have thought about all the things they need to think about for a good life. One of the advantages is that with the previous – what it was like in the trial, was that people would take a long time to do their planning because they had to do all this thinking, they needed a lot of support to imagine life differently or think about things differently. One of the advantages of the quick and dirty plan is it gets people in but they might have this line item in their plan, life transitioning planning and what that actually does is it enables all that planning, there is a funded item in your plan to do your planning. The problem before you had to do your planning before you had a plan so you didn’t have any funding to go through your process. One of the things that I think people aren’t possibly seeing about the so-called quick and dirty first plan it actually allows you to effectively do a decent plan for your second plan. It can give you supports but you need to say that you need it. That might be interesting for advertising or other agencies in terms of providing planning assistance. Then there is specialist support coordination. This is also possibly short term but this one focuses on complex cases that might have a high degree of risk attached. This might include behaviour intervention plans and instructing other support workers such as disability support workers how best to support the NDIS participant. This one is more likely to need people with social work or some Allied Health sort of training qualifications because it’s dealing with the more complex situations. Reflective of that is the unit price for that is $172.13. The hourly rate is much higher but it’s more complex work and you’re probably paying the support workers more. But that $172.00 they pay for an hour support but of course the worker has to go back and do other work. It’s not really an hourly rate but it’s the unit price that would get paid. That’s the little part that I was going to talk to you about – what is support coordination. This question has got the danger of taking us sideways. I am going to do it quickly and then say talk to me separately if you want to go further. Unit price is set by the NDIA and it’s the price that the NDIA will pay for each hour of support. That means if you support a person with disability for an hour they will pay you $172.00 for that support. But the way they’ve come to the number of $172.00 is an acknowledgement that for complex cases probably for every hour of support that you provide directly to the person you might have had to do other work and other coordination to support them. There is a little bit of building in of the overhead and building in of the other things there. That one is a particularly complex one that I don’t have all the details of. It’s one of the things in Better Start that people got agitated about. Better Start, people were charging out Better Start at $120.00 an hour and people would get that’s outrageous that the speech pathologist is getting $120.00 an hour. But in fact they do the hour of support for the person and then they have to write up the notes and then coordinate with the other people and got to do other work. In fact they might do three hours work for the $120.00 not one hours work for the $120.00 but because you can only charge it out at an hourly rate it ends up looking like a higher price. We’ll see how we go in question time, we can come back to that. The thing that I wanted to talk about next is the case for independent support coordination. This is what’s come out of consultation work that we did last year. There is a series of problems in the sector. We’re having to manage all the change same as the service providers, our organisations are having to manage a major major change in the environment. The number one thing is that people in the trials what we see are people with disability are still not exercising their choice and control. They’re not practising their choice and control. It means people are often choosing more of the same. Even though they’ve got choice and control we’re not seeing it in action as much as many of us might like. We know barriers include experience of chronic disempowerment, which makes people much less likely to speak up. A lack of skills and experience in making decisions about what supports they need and where to source them. So if you’ve never been allowed to make decisions about your own life well funnily enough you haven’t got very good at it. This is something that people need to practice. There is a massive lack of trusted navigators. When people with disability and their families need information they rely heavily on trusted navigators to get this information to help take the next step in their lives. We would say that trusted navigators are well-informed members of the community including organisations who have reliable, practical and independent information about the disability support systems available. People with disability in families place a high value on the information provided by trusted navigators, as they know the information provided by them is independent. I think this issue of independence is something – I know in the sector we’ve often talked about the independence of advocacy, but I think we haven’t always added part of that which is the independence of information and the importance of independent information. For us independent information means it comes from a trusted source, it doesn’t have a marketing purpose. It gives decision-making powers to individuals. It supports individuals to advocate for themselves, it results in better individual decisions and it helps safeguard people with disability. Currently there is a significant lack of trusted navigators available to provide funded support coordination and skills and capacity building activities within the sector. The NDIS is aware that this significant gap in the market exists. They’re relying on a market demand to drive solutions. They’re hoping that organisations will just make the decision to operate in that market. They see frankly that some of the independent organisations might move into that market. The next big problem is the conflict of interest concerns about service providers. Many service providers give people with disability and their family information and advice about services and support both before the NDIS and in the current NDIS environment. I know in Victoria there’s I don’t know eighty-six people, organisations are funded just as information providers separately to advocacy. Some of those are just disability specific organisations that might be the only government funding they get. Some of them might be advocacy but some of them are service providers. There are service providers already getting money. It’s important that people understand that this information advice is likely to have a marketing purpose, meaning that service providers often have some level of conflict of interest even if the person with disability thinks they are acting in their interest. This is a common thing. People trust their service providers, trust the workers they know and see a lot. They don’t understand the advice they’re given is a conflict of interest. In our training we talk about the buying of the lemonade. If our ask the provider at the lemonade stores at the market which one tastes the best each one is going to say we taste the best because. You need to ask someone else who tastes both lemonades to genuinely tell you which one tastes the best. But then people’s tastes are different. Maybe for one person one is better and for another person the other is better. It’s very important that people with disability can get information about service providers from a wide variety of places making sure the advice is independent, accessible and meets their needs. Then for us there is funding insecurity. So the NDIS brings very real challenges to the sustainability of small organisations particularly grass roots organisations that provide information support, peer support and advocacy. We all need to adapt to the new environment in order to be sustainable. This is because basically the same as everyone else, we’ve been block funded too. Because we’ve been block funded now we’re going to move to individualised funding, particularly if you’ve been an information provider, maybe slightly different for advocacy, but for information provision that’s been block funded. Now we have to think about individualised funding packages that are attached to individual people with disability in the form of NDIS plans and or think about ILC grants. But once that’s ramped out. Another challenge to us is charging fee for service. We’ve always prided ourselves that we don’t charge people with disability and family’s money or the minimum that we can because we understand that people often find that very difficult. But of course the things that we provided were never free it’s just they were block funded and we provided them to the community for free. But now instead of the money coming to us and we dividing for free the money will go to participants and they will have enough money to pay. We have to get our heads around the fact that maybe we have to charge a fee for a service. This may seem contrary to the original mission of many organisations but I think it’s worth having a think about it because it may be possible that you can both charge a fee and remain true to your mission and vision given that the environment has probably changed significantly from when your organisation was established. The other thing to be aware of is the NDIS will fund some information and support activities within plans. So disability support organisations, advocacy organisations, often connect people with disabilities into formal services supports and informal services and supports. It’s exactly what I described in support coordination. If you already do these things the answer is that now these things will be funded through plans. That was never available before but now it is. We need to think about what is our existing expertise. Do we in our organisation already have the expertise I just talked about? Do we already have people with the right qualifications and the right personal experience and the right professional experience? The last thing to think about when thinking about all of this is that NDIS Act is very clear about no overlap. One of the things we’d all be familiar with is there is no overlap between the NDIS and the health system for example. If you’ve got a broken leg you go and get yourself fixed in the health system. The NDIS doesn’t pay for someone who has had a car accident and has a broken leg because the NDIS is to pay for the supports that are not available elsewhere. We all sort of know that but in the NDIS itself it will only pay for supports once. So if they fund a certain type of support within plans, then you won’t be able to get that through the ILC. So if you provide very individualised services then you need to seriously look at becoming a registered provider because even though you might go for an ELC grant if the things you do are very individualised they may not meet the ILC criteria. One of the questions that came up in one of our sessions was an organisation that provide support in our schools for Tommy. They said what if we go to a presentation to the staff about Tommy, Tommy is a boy with disability. The answer is if you give a very, very individualised talk about Tommy’s very specific needs or help map out a program for Tommy. Then what you’re really doing is individualised support and probably you need to be looking at if that’s what you do you need to really seriously be looking at becoming a registered provider of supports. If on the other hand you go in and you talk more generally about disability, even though you might have expertise in one particular disability – in my case organisation I used to work for might go in and talk about down syndrome. And even though they might talk about Tommy a little bit, they might talk more about down syndrome in terms of saying that people with down syndrome are more likely to have low muscle tone, more likely to have an intellectual disability, more like to have a learning profile that means they’re likely to be a visual learner. That would be much more general and that’s more likely to come under ILC. One of the things as organisations we need to do is go what sorts of activities do we do, are they highly personalised or more general and that’s to decide whether we should become a service provider of individualised supports or possibly an ILC provider. Of course it’s not for me to tell you what you do but this in one of the things that organisations might think about doing, which takes me into the next part of what I was going to talk about which is ILC readiness. One of the things to do when talking about becoming ILC ready is working out what you do and one of the really tricky things for advocacy, and this goes to the sort of things were talked about at the DARNA Summit earlier in the year, is it’s tricky because it seems like the NDIS is deconstructing advocacy or it’s looking and going this part of advocacy and this part of advocacy are going to sit in individualised plans but this part of advocacy and this part of advocacy might sit in ILC, and this part of advocacy is still going to be funded by DSS. So it’s complicated which is why I’m encouraging organisations, part of the purposes of the workshop, start you’re thinking now even if you don’t start you’re acting now because there is quite a bit to get through. ILC. At the end of our workshop we talk about readiness considerations, we talk about these are the sorts of things your organisation might want to think about before the grants open up because if you haven’t thought about it by the time the grants open up then you’re suddenly going to be stuck with a 4 week or 6 week grants process and you won’t have enough time to deal with all the issues. The sooner you start the thinking the better. One of the things is the ILC will not commence nationally in 2016 and 17. Every State and Territory will transition to ILC at a point that makes sense to them in the broader transition. That’s the language that the NDIS uses. What they mean is the States and Territories fund all these ILC like activities. They fund information, they fund whatever the things that are going to come under ILC. At some point, so during the transition, at some point possibly when there are more people in the NDIS and left in the State system but at a point that makes sense to them, the States will say okay it doesn’t make any more sense to fund these things anymore these things should be funded by the NDIS. It’s that negotiation that happens at a bilateral agreement level between the State Government and the Federal Government not between the NDIA and the State but between the State Government and Federal Government. They will decide when that’s going to happen and then the NDIA have to implement it. That’s why we’ve ended up with this weird stage thing State by State. We don’t know but I am hoping by the time we finish these workshops we do, but at the moment of course we only know ACT. We don’t know anywhere else yet. But what we do know is that will all happen before 2019. So even though we don’t know the order we know it’s going to happen in the next 3 years. We don’t want to be an ostrich and stick our head in the sand and say we don’t need to worry about it yet because we know it’s coming. It’s different for national organisations. But I think probably the only national organisations in the room today are AFDO and DARNA. I might not go through some of the complexity for national organisations. If you did want me to mention it do ask in the questions. Again thinking about the duplication, thinking about if what you do fits under the ILC banner or not, one of the really important things to consider if you’re thinking about ILC is evidence of need. In the ILC consultations the NDIS said it will be looking for applications that provide strong evidence of needs and how the activity meets that need. This is their new focus on outcomes. But it’s the collection of evidence of need that you might want to think about before you do a grant application. Evidence of need is not just about unmet need, it’s also about the things you do well. Now would be the time, if you’re thinking about being an ILC provider and thinking about the activities you do, which might meet the ILC criteria, now is the time to start collecting your evidence. Start surveying the people you support – are you satisfied. Collect data that says the things you do well and also of course ask your members or your clients what things don’t we provide that you think we could. That will tell you about the unmet need. So when you get the grant application and they show evidence of need you will have something to fill out. If you try and do four weeks, four weeks of data is not going to be enough. Activity pricing, another thing to start thinking about. Now I’m talking about ILC. Before I was talking about unit price now I’m talking about activity pricing. Grant application funding within the ILC will require detail budget. Of course a lot of organisations haven’t tracked the actual cost of ILC activities because block funding has allowed things to subside one or the other. For instance when I went into Down Syndrome Victoria, one of the things we discovered is the printed journal we send out four times a year was costing us an absolute bomb. But the flipside of that is when we surveyed members they valued it very, very highly. So trying to do that and so one of the things that ended up out of that was we changed a State based journal into a National journal because it was crippling all the organisations to produce eight different things where there was a lot of duplication. It was better to produce one and let State and Territories have a page each to talk about local issues. One of the things that’s important is what we found is that other things we did effectively subsidises that when we’re going into an ILC environment it’s possible but you will go broke in the process. Now it’s making sure that when you ask for an amount of money to deliver an activity that you actually ask for enough. So doing that thinking because you might need supports, you might need expert financial supports to do that work. So the checklist that we talk about at the end of our workshop on ILC, so we’ve talked about activities – has your organisation started to work out what ILC activities you are likely to seek funding for. Do those ILC type activities align with one or more of the activity streams and that goes into some detail that you would have read up on. Do the ILC activities address one or more of the priority investment areas. Basically it means does the activities you think you might get funding for meet the ILC policy and the ILC commissioning framework document. So there is two different documents you need to align with there. Do your ILC activities deliver on one or more of the ILC outcomes and do they complement the central role of LACs. When I talk about no duplication the other thing to notice is that one of the things we didn’t have a lot of in trial was local area coordination. Now that they’re going to roll out a local area coordination they will not fund LAC type activities through ILC. So if your organisation does a lot of local area coordination type activities then you need to think about what’s going to happen when the LACs actually start doing their job. Measurements. There is going to be an ILC tool kit coming. The NDIA is in the process of developing a tool kit, which is particularly going to be emphasised on helping organisations adjust to outcomes and help people go through. If you see any workshops, which are going to be run by Social Ventures Australia, see any workshops about ILC or an ILC tool kit and you think you might go for ILC funding I highly recommend you attend. Or if it’s an online tool kit I highly recommend that you go through the online resource. So the questions are has your organisation started to measure outcomes for its ILC type activities, has your organisation started mapping the needs of people with disabilities and family you support? By that I mean are you recording the things you do well, are you recording the things that people tell you they would like to see you do or that they can’t get support to do. It’s the met needs and the unmet needs. Finance and pricing have you started to look at the pricing of your ILC activities, do you really know how much they cost, do you know how much your overheads cost? So you can put an allocation of overheads into an ILC grant but you can’t cover 100% of your overheads with an ILC grant. So do you understand what your overheads are? Can your organisation demonstrate strong organisational capacity? This is saying if you’re a $200,000 organisation it’s probably best not to go for $5 million because you haven’t shown that you have got the capacity to run a project that big. It’s saying have you made sure what you’re asking for – that you’re able to demonstrate that you have the experience and expertise to deliver what you’re saying you can deliver. And do you have access to grant writing training or grant writing expertise especially expertise in writing to set criteria. This is one of the things we learnt from the DSO project. One of the things about a competitive grant environment it might be that you meet everything, it might be that your project is really, really good but it still misses out because of the other priorities, because it’s a limited pool of fund, maybe another organisation put in something slightly better or slightly cheaper or whatever. So even though you might have a great activity it’s not a done deal that you will get it. The better your grant writer, the grant writing expertise you have that will help. Efficiency – have you started to talk to potential ILC activity partners? So similar organisations in other jurisdictions or member organisations about efficiency and effectiveness. They’re going to be asking about an efficiency and effectiveness. Where this really comes into play is say you’re a State based disability specific organisation, the ILC is really only going to fund one disability specific website not nine. They’re not going to do a National one and eight State and Territory ones. So have you start to talk to your other jurisdictions about or how might we work together and have you started to think about who your competitors might be because funnily enough the people who might be your partners might also be your competitors. So trying to maybe differentiate what you do. That example I just used, maybe if you’re a disability specific organisation maybe it would be appropriate for the National organisation to submit for a National website on the nuts and bolts of that disability. But maybe the State and Territory organisations might talk about a website that’s about community connections and peer support groups and other things. Maybe you can help not be a competitor to each other because you really tailored what you do and you can say we all support both. So you’re able to be partners in both. Or maybe you end up in a situation where you’re competing with each other but at least you don’t do it accidentally. If you’re going to compete with each other you can do that knowingly. Or maybe you’re thinking about a service provider who you’ve worked with quite well in the past but maybe that service provider might go for ILC funding, the same funding as you do and you really want to make the case you’re for people with disability by people with disability. So there is some complex things to think about. It could be good for boards to think about those issues now. Finally, I’m talking about some of the conflict of interest issues. This is informed by a conversation I had yesterday with Caroline Wilks. I already gave a brief presentation at the previous DARU sector conversation and a few questions came up then. I presented at the DARNU Summit and we’ve also done some training. There are similar questions that come up every time. I went to Canberra to try and sort out whether we could get some answers. The good news is I got a sense of what the answers are going to be and the good news is that clearly these issues will be resolved by the time the review is complete. The bad news is they’re not landed yet. Everything I’ve told you so far is backed up by evidence. We’ve made sure we’re giving you accurate information. We’re now embarking a little bit into reading of tealeaves. I just want to be clear that some of the things I’m going to say to you are the impression I get rather than clear statements. I assume you all know the review timing, the National Disability Program Review timing. One of the things that Caroline said to me a little off the record, because she was relatively new at the time, well I’m saying because she was relatively new, she didn’t pick up that the sector did not have enough information. They’ve done more work on information delivery and my understanding was they were about to tell the sector some more stuff and then we went into caretaker mode. Now we have to wait till we’re out of caretaker mode. The good news is I think there is more information coming once the election settles and we’re out of caretaker mode. I believe that submissions I think closed yesterday or the day before. They’ve just closed submissions. I think they’re accepting more but I think they now start their deliberations from now. They fully intend to have recommendations to the Minister in October and they full expect to be telling the sector what things are going to look like by the end of the year. These are my observations of the discussions. I get the sense that some reassurances are coming in terms of there is no great desire to kill off organisations and to kill off small organisations. There is a great desire to not lose expertise from the sector. I was very pleased because I didn’t know the team in that area at all but I did feel they were internally advocates for advocacy. Internally they are pro advocacy philosophically and I thought that was happy, a good thing to see. I am Eve. I belong to the Disability Resource Centre down at Dandenong. I know that the advocate is a very small advocate service. She does very well. We do need NDIS and I do know that the advocate did say that those who have been once the NDIS is very close, it’s coming through in 2018, but she also has said that she feels as though many of the students or the clients that she helps will miss out once the NDIS has well and truly come through. She is asking that question why and I would probably be asking the question why has it been taking so long to be rolled out? It’s an interesting thing because they have to get themselves organised is part of the answer to that. Organising for 460,000 people is a lot. Changing the system is a lot. So they’ve had to put things in place and really they’re actually doing it pretty quickly when you think. So during the trial they made about 800 access decisions per month. That means about 800 people came into the scheme per month, during the 3 years of the trial. Over the next 3 years it will be 12,000 people. So it’s fifteen times as many are going to come in. It’s been about them making sure they can set up they can cope and they really will with those numbers. The NDAP review itself is going to specifically look at conflict of interest issues and is specifically going to – so it’s really pleased. The bad news was they weren’t able to say to me where they were going to land but they said there was going to be discussions on this and they were going to work really closely with the States and Territories. One of the other things that’s come up is the potential inconsistency between State and Territory advocacy programs and the NDAP program in terms of what conflict of interest is or how to manage any perceived conflict of interest. They are going to work so that by the time they talk to all of you, us, later in the year, that will have been resolved. I was really happy that that was clearly on the agenda. Clearly one of the things they’re thinking about but hasn’t landed is that they may regard support coordination as a special category of provider. Now my discussions with the NDIA so far have been that the NDIA is not interested in having special categories of support. The NDIA has its price list, that’s that. You’re either a provider or you’re not a provider. That doesn’t stop DSS saying within the NDAP program or within the NDAP program you’re not eligible of the NDAP program if you’re a registered provider except if you provide coordination of supports. It’s clear that they are looking to possibly put support coordination in a special category when it comes to managing conflict of interest. No I’m talking about being eligible for the NDAP program. So if you’re going to get funding through the NDAP program, I’m not talking about the conflict of interest of service providers that’s a separate issue, which is being resolved. I’m talking specifically if you’re currently funded by the NDAP program then the question is to be eligible, can you be a service provider and eligible for NDAP. The answer historically, theoretically has been no except I know that boundary has been blurred in a couple of specific cases. They’re looking to un blur that boundary. They’re looking to say this is the rule. To be eligible for NDAP – they haven’t said this yet, you can’t be a service provider. But what is the reading of the tealeaves, where I think they’re heading, is you can’t be a registered provider to be an NDAP provider except if you provide coordination of supports. That’s like a special category. But they haven’t said that, they’re considering that. How about the other things you mentioned? I think that will be part of the discussion. That will be part of the discussion. One of the things I didn’t ask and I have realised now I’ve come away is the way the NDIS approves providers is through a support cluster. What happens is you apply and you get approved for a support cluster. You don’t get approved to supply one support item. You support provide a cluster. What we call support coordination is three items within a cluster of I’m not sure how many items are in there six or seven or eight items. This is me, I would think that if they were going to approve support coordination, they’d have to say they’d approve that whole assist whatever – I forget what it’s called, the cluster I said – the assist life stage transition cluster. That’s why there’s clearly got to be discussions between now and then and if you have an opinion on that I would highly recommend you write to NDAP. The assist life transition cluster. It has those things that I just talked about – decision supports, transition planning supports and support coordination. Carol’s probably got better advice than me. Actually maybe not but I think there is another category that maybe Paul can help me. Certainly it’s not just assist life change transition. There is another one – that budgetary. Not only plan management, plan management comes under assist life transition. There is another cluster. Peer support and things like that. What I think is that clearly they’ve got to sort that out. They’ve got to sort it out practically so that organisations can – that would be the question. They would have to draw a line somewhere. The question is do they draw the line at life assist transition or do they say they can supply these two clusters? This is the unknown. (inaudible – too far from mic) for Victorian non-NDAP funded we can do what we like. I think one of the things that’s going to happen now as part of this NDAP review is there is negotiation happening with the State and Territories and they’re going to try and bring that into some sort of consistency. Does that (inaudible) are doing it and if service providers are conflicted then there’s no one left? Are providers allowed to do it? Providers are allowed to provide support coordination. They’re supposed to have processes in place but what we all know, what advocacy agencies know, what we at AFDO know through the gap analysis is that in practice that’s not true. But one of the problems is there are very few organisations for the NDIA to point at to go here’s some independent ones. From the NDIA’s point of view – okay I’m reading tealeaves again here just so we understand I’m talking about what I’ve picked up. I get very, very strong vibes from the NDIA. They’re very keen for advocacy and information organisations to be providers of independent support coordination. They would like to see a much bigger well of independence there available to people with disability. But now we’ve got to bump that up again. So advocacy program and say the organisations best place to do that are advocacy agencies and independent information providers. But for advocacy you don’t want lose your NDAP funding because you’ve – well you might be happy to do that but you don’t want to risk your NDAP funding because you’re doing this other thing. A statement rather than a question. I’m sitting here knowing several people who are at or near retirement after 30 or 40 years working in advocacy organisations who have all the skills to set themselves up as individual providers or for the three of them to get together and do so. We could see some really useful things for people out of disability come from people with a lived experience and worked experience and an understanding of where both the service providers and small advocacy agencies fail out of this. There could be some interesting things happen. Yeah I think it’s a wonderful opportunity. Certainly, if I lose my job in the next little while I know what I will be thinking about doing. But I think there’s some really good opportunities there to do things a bit differently if we want to. I know there are many people who are representing the advocates around here who know what they’re saying and know what they’re doing. Even if they can help out with advocates that don’t want to set up an organisation can be there helping them. It’s probably learning some more experiences from them and that would be beneficial. That’s right. One of the things that they’re talking about too is saying if some advocacy agencies would like to become providers and then within the NDAP guidelines that that’s okay, then it’s important that there’s some agencies that don’t as well. That way for people with a disability they’ve still got choice. You can go to an advocacy agency who doesn’t do any support coordination or you can go to an agency that does. Just the final thing I was going to say on that is it seems unlikely at this stage that they will regard ILC as a conflict of interest at this stage. At the moment it looks like if you are successful in being an ILC provider that’s relatively unlikely to be a conflict of interest. One of the things I did want to say, because I think we’re moving into the question time now, I just really want to say strongly about starting thinking but for advocacy organisations specifically, as opposed to information organisations, there’s clearly a whole lot of things that are going to land before the end of year in terms of the NDAP review. I don’t know I came away thinking if I was the CEO of an advocacy organisation I would be having a whole lot of board discussions and I would be doing a whole lot of thinking and start some measuring. But I maybe wouldn’t take any action until the NDAP review is finished. Maybe, I don’t know. Christian. It’s about paying for – there should be that we would basically people who are receiving the NDIS, of course should be able to pay for this but what happened for people who are not receiving the NDIS and they still need support but they cannot afford to pay for it? So it means that you need to have multiple sources of income. What is intended once the NDIS is rolled out fully is there is a commitment by Government that advocacy is going to be funded independently by the NDIS. There is an absolute commitment that the NDAP program is going to continue and that will continue to be funded for individualised advocacy. That means that any person who needs an advocacy support can get it whether or not they’re an NDIS participant. So you can still get advocacy support. The other thing once the LACs, once local area coordination is rolled out, one way of accessing support, not proper advocacy, but one way of maybe linking with advocacy will be via LACs because any person with disability can get support from an LAC. You don’t have to be an NDIS participant. Thirdly to have specific individualised support, to get specific with decision support or specific support in linking you with service providers that’s the bit that will be paid for within a package. An advocacy agency can still just be NDAP funded and provide advocacy like we always have. It can work with our local area coordinators to make sure that the local area coordinators know they exist and refer people to them. But if you want to give individualised support around plan implementation then you have to be a registered provider. In many ways it’s an additional thing. But the fact is that agencies often provide a lot of individualised support so what will happen in the NDIS is that those people might disappear from advocacy because they’re in support coordination, maybe. The idea is not to cut out the people who are not participants. The idea is that they will still have access to advocacy. I think I’m down to the last few questions now so I finish on time. Thanks Catherine. You mentioned the DSS said they thought some – if this whole thing plays out as you’re thinking, that some advocacy organisations then may register to do support coordination but the implication is they will somehow make sure that some advocacy organisations remain pure advocacy or something like that so there is choice. I’ve had informal conversations with them about the same thing and it makes no sense to me. It’s completely naive and bizarre that how could a funding program say you lot of advocacy organisations you can go and find other funding where you can, we will make this accessible to you but this lot here you have to stay entirely in your advocacy box and can’t do other things. But there is no possible way I can see they can do that. I came away thinking afterwards, they have to make it practical. It has to be organisations, you need to be able to do it. Even this thing about maybe we will allow support coordination, really they have to allow the cluster. What you’re saying there is I think what they meant was they won’t push people in either direction. I think maybe what they’re saying is it will be okay to be a provider if they make that decision, it will be okay to do support coordination. There will be some requirements about how you manage that conflict of interest and I’m assuming Carol might be able to shed some light on that. I think one of the things they will do is if you do it then these are the rules. It will be okay for agencies to choose not to and to choose to. I don’t know how they do that by quotas or something because I think at the end the agencies are free to make up their own minds, or should be free to make up their own minds. That’s a bit unclear and I think this is what’s got to be nutted out between now and the implementation is the practicalities of how something like that would work. To be fair to them that’s why it’s difficult. They don’t really want us coming out and saying they’re thinking about this and thinking about that. It’s much easier to go this is how it’s going to work. I don’t know whether I’m doing you a favour or disservice to say the good news is they’re thinking about these different things, but of course we have to wait to see where exactly it lands. I feel like you haven’t answered what your topic was. You were here to talk about conflict of interest and you haven’t said a word about how we need to manage conflict of interest. You’ve told us about what kind of areas, sorry I’m just being honest about what I have heard. You were going to talk about how we can possibly address some of the NDIS services, so what we might want to look at and the ILC and also support coordination. But you’ve said nothing about how we as advocacy organisations, are going to manage conflicts of interest. Well that’s all right. The issue is we wanted to talk about conflict of interest, which we’ve done. You’re right because I can’t talk to you about how to manage – in fact I think you will find the last session might address that a bit better. That’s just apologies for the communication between me and Melissa. Basically I can only talk to you about the things that are in the workshops at this stage. (inaudible – too far from mic) I also know from what I’ve seen that the package is on a slow conveyer belt. Are those packages going to be quicker because there are so many people who have a disability are well and truly dependent on those packages and they are hearing complaint about them being slowly delivered to them? Are they going to be on the path of the conveyer belt? They’ve got to go from 800 to 12,000 a month so they’ve got to get a lot quicker. That’s the plan. We will see how it goes. I think we’re done. Great are there any other questions for Catherine? Well thank you so much Catherine. It was a great presentation I think it was extremely worthwhile listening to it. We will break now for afternoon tea and if we could get back here seated by 3 o’clock that would be fantastic.